Today, the FBI released its annual Law Enforcement Officers Killed and Assaulted (LEOKA) report—this one covering the 41 felonious deaths, the 45 accidental deaths, and the 50,212 line-of-duty assaults of officers during 2015. 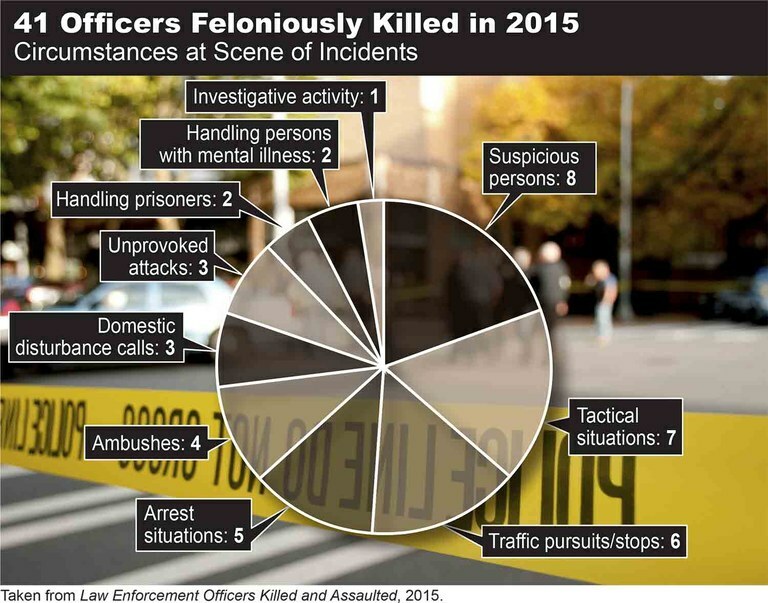 The number of officers killed as a result of criminal acts in 2015—41—decreased from the 2014 figure of 51. The average age of the officers killed feloniously in 2015 was 40, and the average length of service was 12 years. Of the 41 officers feloniously killed, 38 were male and three were female. More than half—29—were on vehicle patrol when the incidents happened. Thirty-eight of these 41 officers were killed with firearms, and 30 of those were wearing body armor at the time. For more details on each incident, read the summaries section of the report. Motor vehicles played a key role in the deaths of the 45 law enforcement officers accidentally killed in the line of duty—29 were involved in automobile accidents, four were killed in motorcycle accidents, and another seven were struck by vehicles while directing traffic, assisting motorists, executing traffic stops, etc. Of the 50,212 officers assaulted while performing their duties in 2015, 14,281 (or 28.4 percent) sustained injuries. And 79 percent of the officers who were assaulted in the line of duty were attacked with personal weapons (such as hands or feet). Law Enforcement Officers Killed and Assaulted also contains a separate section on federal law enforcement officers who were killed or assaulted in the line of duty during 2015. Update to LEOKA Program data collection. Effective March 23, 2016, the LEOKA Program expanded its data collection to include the data of military and civilian police and law enforcement officers of the Department of Defense (DoD) who are performing a law enforcement function/duty and who are not in a combat or deployed status (sent outside the U.S. to a specific military support role mission). This includes DoD police and law enforcement officers who perform policing and criminal investigative functions while stationed (not deployed) on overseas bases, just as if they were based in the United States. The new information will be contained in the 2016 edition of Law Enforcement Officers Killed and Assaulted, which will be released later in 2017. Read more on the criteria used to determine suitability for inclusion in the LEOKA report. In addition to collecting details about the critical aspects of fatal confrontations and assaults — and sharing that information with our law enforcement partners, government and civic leaders, researchers, and the public in general—the FBI’s LEOKA Program conducts extensive research on the data that eventually gets incorporated into officer safety awareness training the Bureau provides.